It is easy to learn how to draw a cartoon frog. Keep your pencil lines as light as you can so that you can erase them easily later. You will start with a rounded triangle shape, similar to a kernel of corn. Keep the point downward with the wide, flat end at the top. This will form the body of your frog. Next, you will add the back legs to the frog. These are elongated oval shapes, pointing away from the body. Now, draw a line down the center of the oval to show that the leg is bent. Add a triangle to the bottom of each leg for a foot. Add in the front legs of the frog. Remember that the front legs and feet will be much smaller than the back legs. A frog's feet are webbed. In order to give that look, you will need to scallop the front edge of the feet. Draw the fingers on the frog's front feet. Now you will begin to draw the face. On the top of the head, draw in two big, round eyes. Add a mouth. Add the eyelids and the pupils of the eyes. Do you know how to draw a cartoon frog lady? Just add eyelashes to the eyes. Try to give your frog some character. Add some 8s laying on their sides. Color a dark spot in the middle. This will give your frog some flies to eat. Give it a lily pad to sit on and create a background and you are done. 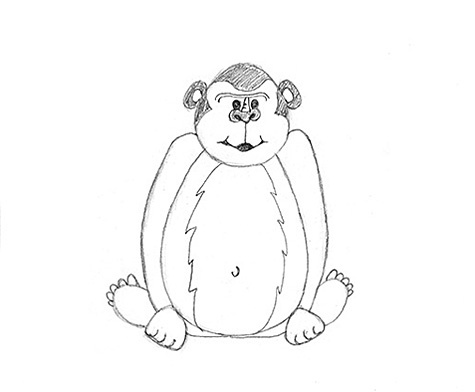 If you enjoyed drawing this frog, you might also enjoy the LoveToKnow Crafts tutorial on drawing a gorilla.